We all live with the same difficulty. What do we do when we have a regret or guilt about something? Perhaps we carry something from years ago. Maybe there has been this thing we’ve felt stuck with for a long time. Perhaps, even just yesterday we spoke or acted in a way that really hurt another person. What do we do with the worry and the guilt and the anxiety over our mistakes? Prayer is the meeting place before God where we bring the worry, guilt, and anxiety over the things we carry from years gone by or from yesterday. Prayer is the safe place where the ugly rocks in our pockets can be brought out and placed before God. Our embarrassment and our shame is loosed off of us, as we come to him this way in prayer. Now prayer is never about condemnation for God is never about condemnation. And it is through prayer that we can particularly come to learn and experience the amazing compassion and understanding of God. For instance, in Isaiah 1:18 we find a stunning example of the all-encompassing understanding of God. The writer of Isaiah begins the book (verses 1-17 in chapter 1) with a litany of the sins of Israel. Basically for hundreds of years all that could go wrong had gone wrong in terms of the people not paying attention to the Lord and walking their own way. For a very long time they had chosen things of death and destruction over the life and love of the Lord. This matter of sin and disregard for the ways of God need only be replaced by a willing and obedient heart and all that we have been weighed down with, is carried away from us – we need not live under it’s weight any longer. Prayer ushers us into this place before the Lord. We must come to understand that sin is not the problem, our hiding and shaming and trying to rid ourselves of our sin is the problem. Mistakes and failures cannot be gone back and undone. We all know this. So we have two choices. One, we add more regret and shame and embarrassment to the sack on our back (except that we were never made for sacks of such things, and such things only make us physically sick in the long run), or Two, we turn to God with our regret, shame and embarrassment. Again, sin isn’t the problem. Does sin create problems? For sure! But in Christ sin is no longer the problem, (Christ took care of the sin problem years ago). Not turning to God with our sin, this is the problem. So we either turn away from God and try to fix ourselves by ourselves, or we turn to God and allow his grace, loving-kindness, and compassion, to wash away the grit and the grime, (and the big lumps of coal that we may be carrying). Prayer turns us to God. It truly is as simple and yet as profound as this. Today, turn to God in prayer. You don’t have to have fancy words. Just a heart that is honest and a trust that he meets you in this place. Perhaps today you might risk to take one lump of coal out of your own bag of regrets, embarrassments, shame, and mistakes, and put it at the foot of the cross of Jesus Christ. Allow, inviting and receiving, the compassionate work of Jesus Christ to wash the weight of that thing away. Take on forgiveness. Take on grace. Enter into compassion for yourself. God is waiting for you there. NOTE: All of the work I do is freely offered to the Body of Christ around the world. If you have been blessed by what we are doing here please head over to Capturing Courage International Ministries website and contribute your DONATION impacting thousands around the world. There are always things we want to be about. In North American culture we applaud and value the one who does things. And while there is nothing wrong with doing things (many things need to be done after all), if we take this, what is in many cases a strength, and apply it to prayer and our inner life before the Lord, it becomes a weakness. For prayer is in many ways about being. Prayer is often nothing more than sitting and resting in the presence of our Lord. In fact, all active outward praying must begin in the simple silent spaces between ourselves and the Lord. This is because prayer reckons on the work of God. It does not reckon on our work. Prayer is powerful because God is powerful. We are not powerful. We do not need to be powerful. God is powerful and we simply rest in him, abide in him, depend on him, trust him. Prayer is often about leaving space for the Lord to work. We come into expectation of what the Lord will do for us and for those we love. We wait on him. We hold our open hands steadily before him. Now waiting seems very passive. But in prayer, waiting is active. There are things that can only be learned and experienced in the waiting. There are works of the Lord that can only happen in the waiting. As I write this, I am gearing up for a 3-month ministry trip to Uganda. I thought I would be going about now. But I am realizing that there is further preparation required. I understand that spending a longer time at home beforehand is a time of deliberately receiving from the Lord this further preparation. Now, I’ve articles to read, books to study, practice of street prayer, all the writing to get done beforehand, and more. But what will really prepare me is the presence of God. There is a work of the Lord that supersedes any study or effort we might bring to the table. The depth of preparation that I sense I need will not come about by my own efforts or by my hand. … WILL NOT COME ABOUT BY MY OWN EFFORTS. The depth of touch from the Lord that you need will also not come about by your own efforts. Peace is powerful. I used to think of peace as simply a describing word to identify the atmosphere of a place. But I’ve come to see that peace is active and powerful. As prayer, the declaring of peace can transform a chaotic situation into something entirely different. Peace drives away confusion, lifts uncertainty, erodes fear, and settles in it’s stead solid assurance and, well, peace. I once lived in a place that had spirits of terror in it. I learned at that time to declare peace over the home in the name of my Lord Jesus Christ. And it was as though a balm poured down and through and terror had no voice after that. We can simply speak peace to anything and anyone that might be in need of it. Where might you need some peace? Where might you declare some peace today? Peace is a powerful agent in this troubled world and as we learn to become agents of peace both in word and deed we bring the heart of our God to bear upon our lives and the lives of those around us. Peace is not description, it is action. Words are powerful. We are told in the Bible that words contain the power of life and death. Because of the power of our words and the power of prayer in the spirit realm it is quite possible to be praying curses rather than life. I have experienced the impact of this against me, perhaps you have as well. I’ve also perpetrated the damage of this against others, perhaps you have as well. The intentions of our hearts, the attitude within our spirits towards someone, flavours and brings an undertone to our words that either creates blessing or cursing. From what I can tell, a disdain in our spirit + prayer = cursing. Hint: Go for the blessing. We do this by ensuring that our unspoken words (the core of our intentions and attitudes) are aligned, honest, and true with the spoken words of our mouths. As we come in prayer the very act of praying in fact tests and purifies our motives. In prayer we bump up against that which we may not be saying but is there loud and clear. Through prayer the secrets of our hearts are revealed and we have choice to become more like God in the words and attitudes of our hearts. Prayer is often for others, but we are profoundly changed in the mix. So we come to prayer in great reverence and with a full sense of the responsibility of our prayers, understanding that both the words of our mouths and the attitudes of our hearts are creating either life or death. We surrender our words to the leading of the Holy Spirit. When we want to say something but realize a check in our spirit, we choose to not say the words we were going to say. When we have a random yet compelling thought to speak something out in prayer we allow and follow the Holy Spirit in this too, we speak out what may not make total sense to us. Prayer is about being the mouth-piece of the Lord. We therefore grow in greater sensitivity to the Holy Spirit and to our own hearts. When our attitudes are off we deal with them. The Lord is growing us beyond ourselves and so we follow him even in regards to what we pray. Years back I read the biography of Oswald Chambers and in his story I learned something that would always stick with me. Oswald was being mentored by a pastor friend who was a prayer sage we might say. Oswald was young and his friend was older with much more experience and history in journeying with the Lord. They were in conversation about praying for others, the necessity and the impact, and then this pastor friend relayed to Oswald that if he did not understand that at times we are to NOT pray for people, that God must direct our praying and our not-praying, that Oswald did not know much about prayer at all. As much as knowing when to pray for people, we must also understand when not to pray for people. We learn that in our advocacy for others our prayers must always be surrendered to the leading of the Lord; when to pray, when not to pray. There are definite times to hold back in declaration as there are times to go forward in declaration. Even our praying must be surrendered to the leading of our Lord. The world needs the voice of the Lord and this comes as we acknowledge and surrender our own tendency to control people and things through prayer, secondly it then comes from us listening for the Lord’s voice and intention (and being silent until we hear him). Only then do we speak out in agreement what we hear the Lord saying. Prayer is incredibly powerful, so we enter into it with holy reverence and care and respect. This sometimes means that we hold back and do not pray, until instructed what to pray. Silent trustful waiting is powerful. So if you don’t know what to pray just wait. Rest in the Lord’s ability to communicate to you. Be in expectation. Allow silence, for the silence is doing it’s own type of work. Prayer is expressed in a number of different ways. The most familiar form is speaking out our heart and mind to the Lord and in turn listening to the Spirit communicating back to us. But there are other forms as well. Worship flagging is a form of prayer. Painting can be prayer. Dancing can be prayer. Prayer is found on our knees and it is as we stand with arms raised. Our hearts expression found through the action of our bodies is some of the most integral prayer of all. Our bodies express what is too deep for words. One time years back I had a friend going through a devastating time. Her world had been tossed upside down and there was no telling what the outcome would be. She had been betrayed and she was deeply grieving. And so we went to our church (where the ceilings were high and enough space to really move), put on worship music and flagged in sacrificial praise to the Lord. There was something powerful as we allowed our bodies to lead the way. While our hearts were broken we made a point of entering into worship of our Lord with song and dance. It made a dramatic difference to both our hearts and to her processing of what had become a nightmare. Prayer through action declares in a mighty way that God is in control and that we surrender our lives to Him. Another friend of mine facilitates prayer painting. The first time I tried this, and every time since, I find out something new about the Lord and about my relationship with him. My friend sets the space. She prepares the paints, the brushes, the water, and the material we will be painting on. She has some worship music playing in the background and opens with a simple prayer of invitation to God, welcoming the Holy Spirit into our midst. Opposite is the first picture I painted in this way. I did a lot of this painting with my fingers. I had no idea what I was going to paint I just followed the leading of the Holy Spirit. I began with this image in my mind’s eye of the robe of God and so I began painting that on the right hand side. I then wanted to paint the blood coming from Christ as our Savior and so that is the red that you see. After the red blood of Christ I painted the green because I know that life is the result of Christ in us. But then the thought of royalty came to mind and of course purple symbolizes this and so that is the purple you see. As I kept working on the painting bit by bit, colour by colour, I kept wanting to paint myself beside the robe of God. But I couldn’t. Something was stopping me. Meanwhile I kept adding to the robe with gold and purple and after some time and in the blink of an eye I all of a sudden realized that I wasn’t painting his robe but I was painting the fire of God, and not only was I painting the fire of God but I couldn’t paint myself beside it because I was in it! I was in the fire with the Lord. And in another blink of an eye I saw ever so clearly that the fire of God is the absolutely safest place to be. I wrote this verse on the bottom of the picture and I then went on to write my own ah-ha moment about safety in the fire and the experience that Shadrach, Meshach and Abednego must have had in the fiery furnace as they met the Lord there. More than a picture this became an intimate moment with my Lord. I followed the lead of the Holy Spirit and allowed revelation and then confirmation and encouragement. I keep it on my wall to this day to remind me that when we stand in the presence of God, when we stand in God, we are encompassed in his care and transformation and grace and protection. It was a particular encouragement at the time because the symbolism spoke so much to me. It spoke to me that I had been healed and transformed enough to be in the fiery presence of God. My journey had definitely had a lot of fire in it. But like the bush that burned but was not consumed I could now carry the light of my Lord. After years and years of inner healing work this was a marker and an indicator of my progress in the Lord. In looking ahead to life to come the verse in Genesis 49:24 was great encouragement; I was not going forward on my own in any way whatsoever. Rather, I could hold steady under whatever might come my way because I have the backing of the Champion of Jacob, the Shepherd, the Rock of Israel. Amen! I quite frankly know no other way of going forward into the things the Lord is calling us to without his express word over our lives. Prayer does this. Prayer enters us into the presence of God and opens our awareness of things beyond us in ways that strengthen and propel us forward in greater hope and rest. It’s all about making the space, taking the time, and waiting on him. When we meet with the Lord in prayer we come to be changed from the inside out. I depend on God’s transformative power for who I am. Not a season goes by but I don’t need the Lord to do some new deep work within my person. Do you feel it, that deep need to have transformation come to your own soul? There are a lot of things that I can accomplish and strategy that I can put together, but there are inner strengths and courage and clarity that I can’t get any other way than to sit in the presence of God and simply wait for him to grow and heal and change me. The thing is, as I’ve mentioned before, we often believe prayer to be about showing up all spiffy with shined shoes and pretty frocks, suits pressed to perfection; but this simply is not the way of prayer. Come to prayer all put together and you have little to offer the Lord and absolutely no need to receive from him. Do you recall the story of the woman at the well as told in John 4:6-15. Jesus had become tired and sat down at a well in the middle of the day. A Samaritan woman was at the well and Jesus began to speak with her. In short order he revealed to her who he was and she, on her part, immediately acknowledged her need of what he had to offer. There was no doubt in her mind that she had a need. Today, it’s no secret that some of the most difficult people to bring to the well of Jesus Christ are often Christians. We somehow settle into pseudo gospel lives that leave us striving, perfecting, and denying our need, and yet we must take a lesson from the woman at the well and her easy acknowledgement of need; remember after all that it is the poor in spirit who will see the kingdom of God. The question becomes, how thirsty are you for God? Are you coming to the well with a tiny tin cup, a mid-sized jug, or a bucket as large as you can find? The knowledge of our own need becomes the amount of God that we receive. Prayer is not about coming with our jug full-up showing God what a good job we’ve done with ourselves. No! It’s about coming with our bucket empty and simply sitting alongside the one who is the source of living water. Jesus will fill us up, if and as we know our need and come ready and expectant of his transformation in our lives. 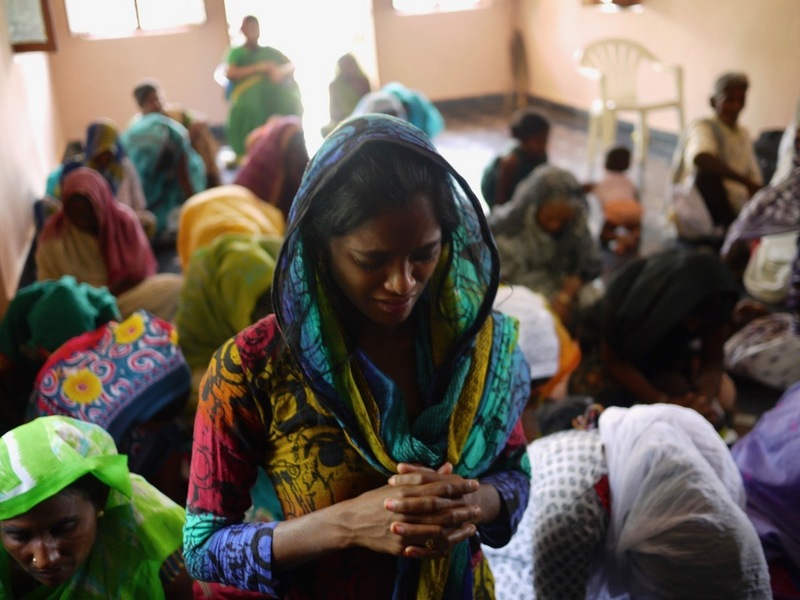 These needful expectant prayers are the kinds of prayers that are barely spoken out loud. They are like breathing out our lack, a silent moment before the Lord where we see a little more clearly how bereft we are of all we need to be, and where we simply raise our plea for deep inner change to God; a deep need breathed out to God that rises as incense to him. God loves these moments where we come to the end of ourselves in some way and simply breathe out our need for him. He comes then, not rushing in as on a knight on a white horse, but over the course of some days and weeks we lift our gaze to the landscape of our souls and find that we are different. The fears we had are gone, the confusion has lifted, strength is new and vital, courage is increased. God is good like this. Living waters filling us up, for any who might acknowledge their need and breathe their invitation God’s way. Today I am sick. Still sick. I’ve been sick for eleven days now. Yesterday I laid in the sun and sat in a chair and laid on a couch, all day long. It’s not as fun as it sounds. Simultaneously I’ve been trusting and waiting on the Lord’s timing and provision for going to Uganda in a month’s time. And while there are those in Uganda on their knees every day before the Lord praying for this, the thing is, the expected date of departure is just around the corner and so far we have about 11% of the necessary budget raised. I’ve had people praying for my health, people praying for this ministry trip, and from what I can tell at this moment I am still sick (so sick that I am cancelling all plans for the next three days) and it doesn’t look like I’ll be in Uganda when I was thinking. But I am remembering this morning that I’ve been here before. I’ve been in this place where I’m not sure what is up or where I am in the big scheme of things. And what I’ve learned over the years is that I ALWAYS look back on these times and clearly see the hand of God in the timing and the provision and every single element and I recall that I am ALWAYS brought to delighted praise of my Lord who puts all things together well. So today, I am praising the Lord. Why wait until I can look back and understand why, I may as well praise the Lord today even as I am sick, even as I’ve cancelled my attendance this weekend at a once-this-year-opportunity, and even as I’m not sure what way is up in terms of a ministry trip to Uganda. Perhaps you are also in the midst of something that carries little understanding at this time. Perhaps you too are wondering which way is up with something you are seeking and waiting on the Lord for, and perhaps today you might join me in praising our Lord who does all things well. “God we come to you in the name of our Lord Jesus Christ. We acknowledge that you are God and that you are holding our lives in the palm of your hand. Nothing escapes your awareness and so we recommit our trust to you Lord this day. These plans and things on our hearts we bring and lay at your feet. You know all the particulars better than any of us anyway and so we loose off our concern and control and make these things an offering to you. Sometimes we have unrealistic and unhealthy expectations about prayer. Today I speak about tension and it’s role in our prayer walks with the Lord. Now, for many of us tension is a bad thing. For some tension speaks of dissonance, threat of safety, is indicative of something wrong, or any number of other things. Many of us have not learned to live in tension and this shows up in our prayer life. Quite frankly it is not always comfortable to come to God in prayer. Many times we are unsure and insecure. Quite naturally our flesh pulls away from the living God and even our soul can tread carefully. We somehow intuitively know that coming close to God will change us and we, at our core, are not really too sure about this. If we believe tension is bad and wrong, indicating something not quite right with ourselves, then we will have a hard time coming to God in prayer. If we expect prayer to immediately dispel our uncertainties we come with false expectations. Thing is, tension is the place and the very space where growth and learning happen. Put another way, refusing to enter into tension we will not grow. And for those hell-bent on avoiding tension, prayer is made into an idol of comfort. Do we find comfort in prayer? For sure. Do we extend comfort to others as we pray for them? But the authority to impart comfort comes not from making it the product of prayer, but rather of the faithfulness required to enter into prayer again and again when it is anything but comfortable. Perhaps we think that prayer warriors have this great secret to comfort and grace of God in prayer. Guess what, they do, but it’s not what you think it is. The secret is coming to God and learning to sit in the tension, again and again and again. This tension, you see, is the intersection between God and mankind and it is the place where miracles happen. To see the power of our living God active and played out in our daily lives requires that we enter into the tension of a simple people coming before a mighty God. There is no way around this. So, don’t wait until you feel comfortable about prayer. Use the tension to compel you to God. Harness the emotion of tension that you feel inside of yourself to greater honesty before the Lord and as you simply sit in His presence. “God I come to you today freaked out. You scare me to bits a lot of the time. I’ve never been real good with tension but I realize today that you are in fact found in the very centre of what I’ve been trying to avoid. So, I’m bringing myself to you today confessing that I’ve been wanting prayer to be nice and neat and comfortable. And I am asking that you teach me about tension and about intimacy with you that I might grow and learn at your feet and by your side no matter if I am afraid or not. Frankly, this makes me sick to my stomach. If we want to parse out the sentence this might be technically true yet the spirit of it reminds me of our human tendency to have agenda’s for those around us; it just doesn’t sound much like God to me. I’ve known people who are full of agenda. Perhaps you have as well. They don’t really come across as safe. It is hard to be open with them because it always seems that they are searching and listening for something to get you with. In contrast, when it comes to prayer space with the Lord it is not about agenda but about invitation. Of course, unless we know this we come to prayer defensive and doubtful to what our time with the Lord might really be about. What we don’t readily understand is that God is just really glad to simply sit with us. He wants to bask in your presence as much as he invites you to bask in Him. Prayer is not a back-handed maneuver by God to get us. He simply walks in greater honour than this and is passionately at work to preserve your dignity. If there is one thing I have learned over the years it is that God is not in a hurry to fix any of us. If God has any agenda it is to simply be by our side. Really. Truly. There once was a man named Noah. His life had been long and varied. He had walked in obedience to the Lord in building this really big boat and in this the Lord used him to preserve the created work of the Lord from a terrible flood. After all of this, and as he and his family began to resettle into the land, Noah began enjoying the fruit of their labours and there came a day when Noah drank too much wine and he passed out naked in his tent. Now Noah had three sons. One of his sons saw his father naked and proceeded to tell his two brothers who were outside the tent. Can you imagine the scandal that might ensue as word got around? Yet the two other brothers took it upon themselves to find a blanket and to walk backward into the tent, so as not to see their father’s nakedness (refusing to dishonour him), and lay the blanket on him. Now I don’t know if you see it or not but the symbolism and lessons in this simple story are stunning. Let me explain. We in our fallen human nature are drawn to exposing each others nakedness. Now I’m not so much talking about our physical nakedness as much about our emotional, psychological, and spiritual nakedness. When someone does something out of line we like to expose that person, making mention of him or her and drawing attention to the indiscretion in some way. God does just the opposite. God is the two brothers who take the time and due diligence to preserve the honour and dignity of their father regardless of his folly or lack of prudence. God never exposes us. Never. Rather, God in the form of Jesus Christ came to become our covering and to model to us this same extending of dignity and love. This spirit of God’s love is played out by the two sons of Noah who chose to cover over their father’s sin and embarrassment and shame, rather, than making mention and a spectacle of him. They chose deep honour and understanding in their action towards their Dad. Wouldn’t you like someone to offer this kind of response to you when you screw up? Well, guess what, this is the response of God to you. This is the act of Jesus Christ for you. So today as you come to the Lord in prayer simply enter into his presence as one covered and honoured.